China has done a fabulous job in forcing foreign companies to play by its rule in the past. The government there has allowed foreigners the access to its huge market, in return for setting up factories and research centers in the country. It has fostered firms who have managed to learn the technology and set up cheap manufacturing themselves. This has allowed China to become the biggest exporter in the world. India on the other hand, has a weak and government led by pygmies. The ruling party is ruled by a dynasty and the PM is a powerless bureaucrat with no power. The ministers are busy full time in lining their pockets and retaining political power with no time to think about the progress of the country. There are periodic alarms about the huge quantum of equipment imports and how the country is totally depended on the outside countries for its basic needs. There are some reports made by highly paid consultants which gathers dust. The new semiconductor policy is a classic example of the Indian government’s incompetence over a long period of time. There is no vision and the attempts are half-hearted and useless. Same is the case with the telecom equipment and power equipment policies. India has a robust private sector with global leaders like Tata Motors, TCS etc. However, they have also been subverted by the system and are busy in gaming regulations rather than creating value (for most companies I think). company sells thin film solar panels which are allowed to be imported by solar plant developers under India’s JNNSM. 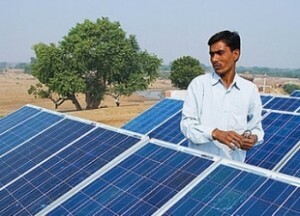 This has led FSLR to capture almost 80% of orders in India’s JNNSM built solar plants making a mockery of India’s efforts to promote domestic manufacturers. The company is now colluding with the US government to prevent India’s 2nd phase from closing this loophole. India is the only big market for FSLR outside of its own country, as it cannot compete in the Japanese and Chinese market. The FSLR CEO has realized this and is making a huge effort in growing its presence in the Indian market by tying up with the local players and making statements against India’s domestic content policy. The country has also abandoned a plan to set up a multi-million factory in India, as it does not think that the government will impose anti dumping duties against it. Let’s hope that the Indian bureaucrats and politicians can look beyond their own selfish interests and do the right thing. However, I don’t think that they will rise to the occasion.